Brooks went big at The Running Event. 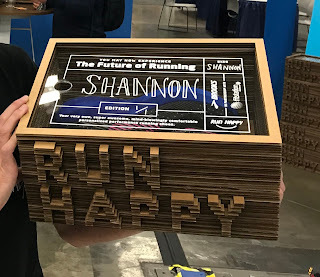 They had the largest booth, great new shoes, a lively party as always and in classic trade show biz style a huge hook as they measured runners and made shoes live on the show floor with partners SuperFeet and HP using a full manufacturing cell. Brooks and a partnership of SuperFeet who will make the shoes and HP which developed Fit Station demonstrated how runners feet measured in 3D along with a biometric analysis of stance/gait, all done in running stores, will in the near future see personalized shoes "made to order"in a next evolution of Brooks Run Signature program we first saw in 2016 at Outdoor Retailer. 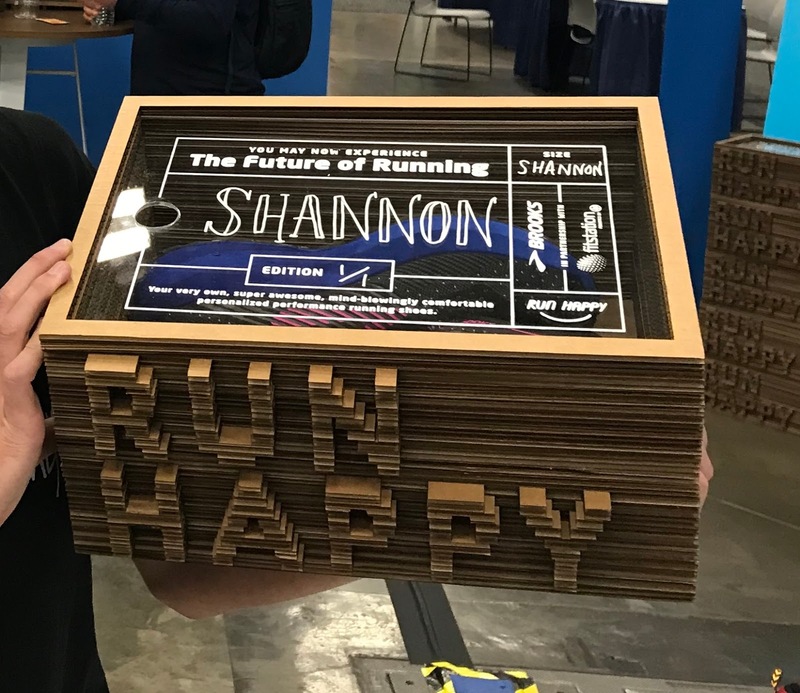 After the scan, the runner's data was sent to a manufacturing cell right next to the FitStation where within minutes a custom shoe was produced in only two major steps. Based on the data a last, the green form, was selected for the runner's foot shape. In this initial demonstration, for each size, one of several different arch lengths could be selected. In the future the plan is to have yet more customizable lasts, potentially with modular elements snapped together like a Lego. Once formed the last and upper is placed in the molding machine to the left with on the bottom of the mold the outsole. The AMP DNA material, a polyurethane instead of the usual EVA, and same as in the Levitate (RTR review) is shot into the mold, taking the underside shape of the last- the arch length selected, with upper, midsole, and outsole all shot and bonded together in one step. When last and personalized molding pressures (leading to personalized firmness/softness in the shoe) are combined the shoes will be able to be tuned to the runner's data for pressure patterns, heel rotation, propulsion index, and dynamic knee variations. After a few minutes of cooling the shoe was essentially finished. This said we did not see a step where the outer TPU skin was painted to midsole as the skin really stabilizes the midsole in the current Levitate. It is unclear if a new blend of PU will not require the skin for these shoes. The whole process was carried out by engineers and technicians from the German company which builds and sets up the manufacturing cell Superfeet will have in their US facilities to make the shoes for Brooks. Our contributing writer Shannon Payne received her very own pair in this cool box which she will test. Those receiving pairs were told that as Levitate RS were prototypes their durability in terms of bonds and finish made them not guaranteed to be actually runnable in terms of durability. Perfectly OK as this big reveal and show was a live proof of concept and a very impressive one. There are many implications for FitStation. Most importantly, runners will eventually be able to have shoes rapidly made based on their personal biometrics and preferences. Second, running retail stores will have a way to compete with online retail by providing the scanning services and then making the sale. It was unclear what would happen in terms of data ownership for new orders for a given runner and their measured characteristics. Finally, manufacturing will be closer to the consumer reducing waste and energy consumption by making each shoe a "lot size of one", allowing Brooks to more rapidly iterate model changes, test new concepts, and produce special editions. SuperFeet will also be custom making a recovery slide, the Superfeet ME3D. If I would come to this city again, I would be all over the Chicago event venues. We ordered Spinach artichoke dip at the server's suggestion and it was absolutely delicious.